A distributed denial-of-service (DDoS) attack is an attack in which the multiple compromised devices attack a target and cause the denial of service for users of the targeted device. During DDoS, a targeted system is flooded with incoming messages, connection requests or malformed packets in order to slow down/crash the system or to exhaust the network bandwidth. As a result, the service is denied to the legitimate users or systems. This article discusses the objectives and principles of the DDoS amplification attacks. Role of the Reflector in a DDoS Amplification attack. Reflector is a server that is reachable from the Internet. It offers a service to clients (DNS, NTP, SNMP, gaming, etc.). An example of a reflector maybe a misconfigured DNS server (or left in a default state) or a public DNS server intentionally configured to provide open recursion for clients in the Internet. In any case, a reflector has no intention to be part of the DDoS attack. How do the amplified DDoS attacks happen? Attackers launch a DDoS attack flooding a reflector with queries that seem to be a legitimate request for service. However, the network traffic contains a spoofed source IP address of a victim, e.g. web server. IP spoofing is performed for two reasons. Firstly, it hides the identity of an attacker. Secondly, a query response sent from a reflector to the victim is significantly larger than an original query request. For instance, in case of a DDoS DNS amplified attack, a query response contains many IP addresses for the resolved domain. It makes the response asymmetrical in terms of the consumed bandwidth. Therefore, a reflector amplifies the DDoS attack, consuming the victim’s bandwidth much faster. With the Botnet, the command-and-control server (C&C) instructs thousands of bots to send requests to a number of reflectors in parallel. It significantly increases the attack traffic and successfully obfuscates an attacker’s identity from detection. To increase the volume of the attacks, the single DDoS attacks, exploiting various application protocols such as DNS, NTP, SNMPv2 and others can be combined and conducted simultaneously. 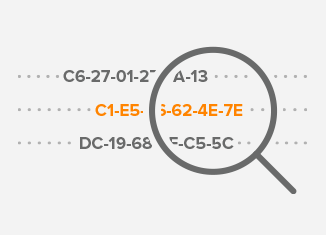 Various application layer protocols such as DNS, SNMPv2 or NTP can be used as vector attacks. All of them have something in common. They use UDP transport protocol to handle transmission. Using the connectionless UDP instead of the connection-oriented TCP is crucial for a successful DDoS amplification attack. When TCP is used, a 3-way handshake between an attacker and the reflector is a must. The attacker sends an IP packet to a reflector, with a SYN bit set in the TCP header and a spoofed source IP address of a victim. Accordingly, the reflector sends an IP packet to a victim, with both SYN and ACK bits set, as a response to the received SYN packet. The victim discards the SYN-ACK packet because the first phase of a handshake has not been initialized by the victim. There is no amplification behind the received SYN-ACK packet. Both SYN and SYN-ACK packets have the same length (60 Bytes) because they do not carry any application protocol data. In the case of UDP, the situation is different. UDP is a connectionless transport layer protocol which means that a handshake is not done in order to establish communication. The response reflected and amplified by a reflector targets a victim who needs to deal with it somehow . How is the amplification measured? 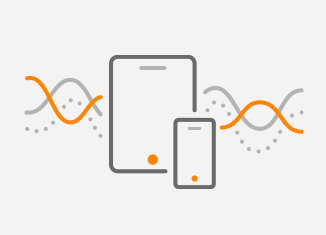 Some application layer protocols are more suitable for amplification than others because their bandwidth amplification factor (BAF) is higher . For instance, SNMPv2 can reach BAF 6.3 while NTP 556. BAF can be calculated as the number of UDP payload bytes that an amplifier sends to answer a request, compared to the number of UDP payload bytes of the request. The volume of a DDoS amplification attack is also dependent on the number of available resolvers. For instance, there are 4 832 000 SNMPv2 resolvers and only 1 451 000 NTP resolvers. What is the largest DDoS attack detected? The largest DDoS attack ever recorded is the 1.7Tbps memcached amplification attack against the unnamed customer of a US based service provider. The attack was recorded by Netscout Arbor, on March 5th, 2018. The attackers used a known vulnerability of memcached servers and exploited thousands of misconfigured memcached servers exposed on the Internet. Memcached is an open source distributed memory caching system, The purpose of the memcached servers is to cache frequently used data to improve internal access speeds. Its default service is via UDP. Attackers exploited the memcached servers by sending a forged request to the targeted memcached server on port UDP 11211, using a spoofed IP address that matches the victim’s IP. Subsequently, memcached servers responded with a stream of UDP packets, flooding victim’s IP address. Service providers should implement ingress filtering described in RFC2728 to prohibit attackers from using forged source addresses which reside outside of the assigned prefix range. Very often, servers are left in a default state and are exposed on the Internet. For instance, in a version of the BIND DNS server prior to (and including) 9.4.1, the default behavior of the BIND servers was to allow recursion for all clients unless otherwise specified. Open recursion allows a server to be exploited by attackers targeting a victim with the DNS amplification attacks. For this reason, the default behavior was changed in BIND 9.4.1-P1. Similarly, since the version 1.5.6, memcached server disables the UDP protocol by default. Anycast provides DDoS mitigation by offering failover alternatives if a node is attacked or goes down. The attack traffic is balanced across a network of servers or it can be confined to certain areas. . The Intelligent Routing Platform can be configured to automatically add throttling Flowspec policies for prefixes that started using abnormal volumes of traffic. rate-limits excessive bandwidth usage prefixes at their average use times throttling multiplier. Past throttling rules are revised if/when prefix abnormal usage pattern ends. For example, when a prefix usually consumes 1-2Mbps of traffic and its current bandwidth spikes tenfold while the spike is sustained for a significant period of time, a throttling rule limiting usage by this prefix at 5-6Mbps will still offer ample bandwidth for normal service use and will also protect other services from the network capacity starvation. Note: The exhibit is intended for education purpose only. Noction is NOT responsible or liable, directly nor indirectly, for any damage or loss caused or alleged to be caused by or in connection with the use of software or commands presented in this exhibit. We are going to demonstrate the DDoS DNS amplified attack with the dnsrdos tool against a host located in our lab network. The victim has the assigned IP address 172.17.100.5/24 and the attacker is configured with the IP address 172.17.100.6/24. Our goal is to force DNS server to send DNS replies back to the victim as the response for queries for domain google.com. This kind of attack does not require any special knowledge and it can be easily conducted by the unskilled threat actor. First, we will download the source code of the dnsrdos and compile the code. We start to send DNS queries to the DNS server for a domain google.com with a spoofed victim’s IP address 172.17.100.5. The tool will loop through a DNS server stored in a file dns.txt 20 times. Picture 2 depicts the sent DNS queries from an attacker to a resolver. The length of L2 PDU is 70 Bytes so a length of the IP packet carrying DNS query is 56 Bytes (the length of Ethernet header 14 Bytes). Notice the length of the L2 PDU in Picture 3. It is 166 Bytes what makes 152 Bytes for L3 PDU. The DNS server is acting as an amplifier, sending the DNS query responses to the victim that are almost 3 times larger than the original DNS queries. The same infrastructure is used to simulate the attack. We will use Scapy – the packet manipulation program to generate UDP memcached packets sent to UDP port 11211. Enter scapy shell and send one packet to a public memcached server 130.226.11.41 with the command below. The L3 PDU size sent from an attacker to a memcached server is only 43 Bytes (Picture 4). 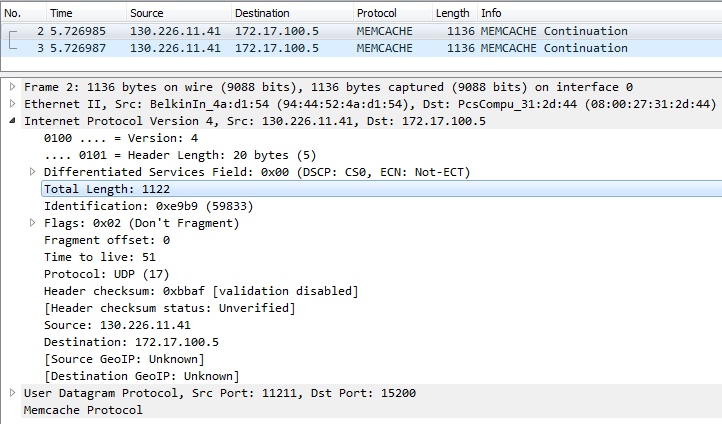 Notice the length of the UDP packet being 122Bytes, sent from the reflector (memcached server) to the victim (Picture 5). The response is 26 times more powerful than the original IP packet. According to Cloudflare, memcached protocol is one of the most convenient protocols to be used by attackers for amplification. The protocol has zero checks, data are delivered to the client with fast speed, requests are tiny and responses are huge (up to 1 MByte each). With the growth of the IoT devices, the scale and frequency of DDoS attacks will increase. Therefore, DDoS attacks must be taken seriously and adequate precautions should be applied in order to prepare for the attacks and mitigate their impacts. 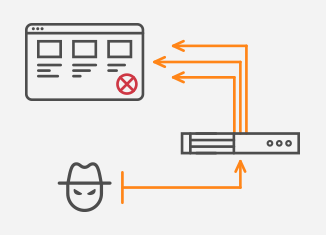 The consequences of DDoS such as service disruption or loss of data may harm your business. Moreover, the DDoS attacks may be carried to distract your attention and defense mechanisms so the smaller but more dangerous attack running in parallel may remain unnoticed.